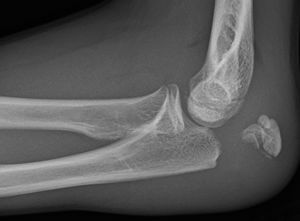 Olecranon fractures frequently occurs with elbow disorders. These fractures are regarded as one of the simplest articular lesions and its operative and physiotherapeutic treatment are straightforward. These fractures are mostly intra-articular and are generally associated with joint effusions and hematomas. Extra-articular fractures include avulsion fractures and are most commonly seen in the elderly. Insertion point for triceps, thus plays important role in extensor mechanism of the elbow. 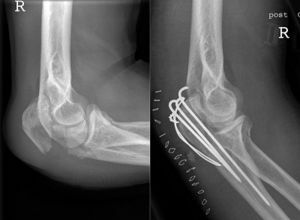 Patients with a broken olecranon are unable to extend their arm. The Mayo classification system of olecranon fractures are based on the displacement of the olecranon, comminution and elbow stability. There are 3 types of fractures, each with two subtypes. Management of olecranon fractures depends on displacement, comminution , and elbow stability. Primary elbow instability and fracture morphology are prognostic factors for elbow function and development of arthrosis after operative treatment. The aim of this management is to restore the extensor mechanism of the elbow, and reconstruct the articular surface. Type II + III: Require surgical fixation. Indication: Articular surface is too comminuted or osteoporotic for fixation (elderly/low-demand patients). Method: The triceps tendon is reattached to the proximal edge of the articular surface. Gentle active elbow flexion (without splint). Reparative phase: None to minimal stability in the elbow. Olecranon fractures are typically caused by a direct blow to the elbow, but an avulsion fracture can also be caused with excessive triceps contraction. Surgical management is the treatment of choice, with specific guidelines for physiotherapy going with it. 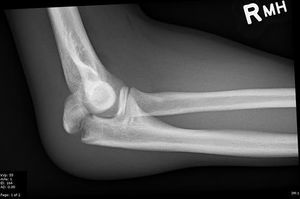 Even with the best rehabilitation, permanent loss of some elbow extension is a common side-effect of this fracture. ↑ 1.0 1.1 1.2 1.3 1.4 Donegan RP, Bell J. Operative Techniques in Orthopaedics: Olecranon Fractures. Elsevier, 2010. p.17 -23. ↑ 2.0 2.1 2.2 2.3 2.4 2.5 2.6 2.7 Hoppenfeld S, Murthy VL. Treatment and Rehabilitation of Fractures. Lippincot, Williams & Wilkons, 2000. ↑ 3.0 3.1 3.2 3.3 3.4 3.5 Walters J, editor. Orthopaedics - A guide for practitioners. 4th Edition. Cape Town: University of Cape Town, 2010. ↑ 4.0 4.1 4.2 4.3 4.4 Meeusen R. Elleboogletsels in Sportrevalidatie. Kluwer, 2009. p.11-15,47. ↑ 5.0 5.1 Lavigne G, Baratz M. Fractures of the olecranon. Journal of the American Society for Surgery of the Hand, 2004;4(2):94-102. ↑ 6.0 6.1 6.2 Hutchinson DT, Horwitz DS, Ha G, Thomas CW, Bachus KN. Cyclic loading of olecranon fracture fixation constructs. Journal of Bone and Joint Surgery 2003;85(5):831-7. ↑ 7.0 7.1 7.2 Koslowsky TC, Mader K, Dargel J, Schadt R, Koebke J, Pennig D. Olecranon fracture fixation with a new implant: biomechanical and clinical considerations. Injury, 2009;40(6):618-24. ↑ 8.0 8.1 8.2 Kozin SH, Berglund LJ, Cooney WP, Morrey BF, An KN. Biomechanical analysis of tension band fixation for olecranon fracture treatment. Journal of shoulder and elbow surgery, 1996;5(6):442-8. ↑ 9.0 9.1 Rommens PM, Küchle R, Schneider RU, Reuter M. Olecranon fractures in adults: factors influencing outcome. Injury, 2004;35(11):1149-57.